There’s a four tiered system of Indian restaurants in Birmingham (I’ve decided, it’s not official, you understand). Let’s start at the bottom, tier 4, the dives that are frequented by drunks at 2am for a post lager curry – you know them, the Kohi-I-Noor, and the like. Then there’s the tier 3, cheap as chips and tasty, like The Royal Bengal, which we’ve been to many times. 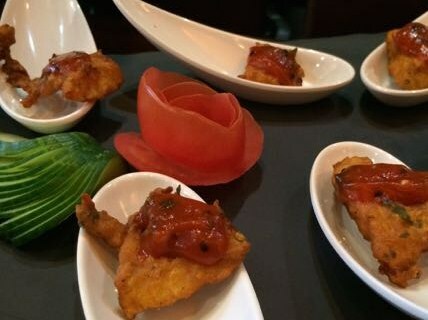 Tier 2 are the slightly pricier places with linen napkins, and generally better service and presentation, such as Maharaja and Celebrity Indian. And finally tier 1, which includes Pushkar, Lasan (actually Lasan are probably a special tier 1++), Asha’s, and Itihaas. 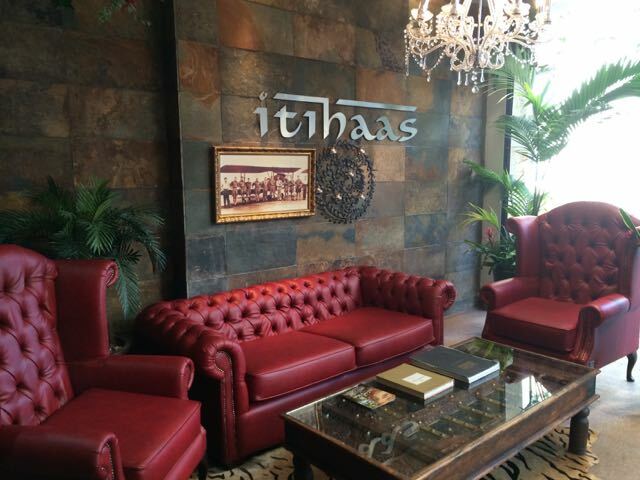 It is the latter, Itihaas, who have recently had a bit of a makeover and who invited us to a taster evening. It’s not lost on the owner of Itihaas, Raj, that the location is a bit tucked away from the city’s dining centres, and he wants to draw more people in to eat and drink, and to make it a destination. To that end he’s employed the makeover skills of local interior designers Mr. McQueen to redevelop the bar, to make it feel less corporate. The night we attended the makeover of the bar areas wasn’t quite complete, but having seen photos since it looks like a Nuvo/MPW type affair but with Chesterfields. Another place in which to be seen. I can’t comment on how well the makeover has done because I don’t know what it looked like before. 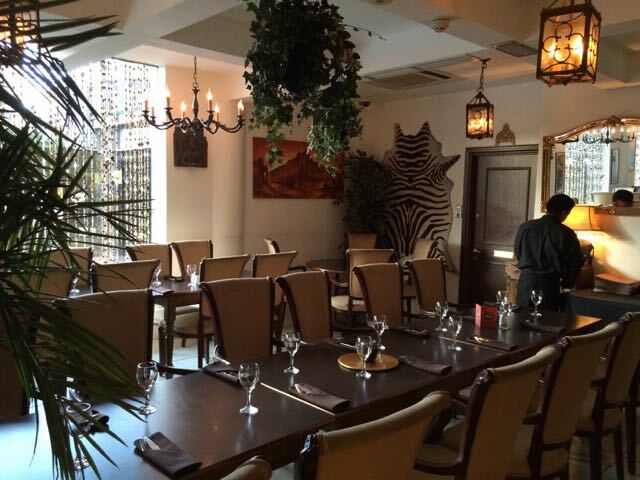 What I can comment on is that the main restaurant has an attractive colonial quality (although a zebra skin in an Indian restaurant? 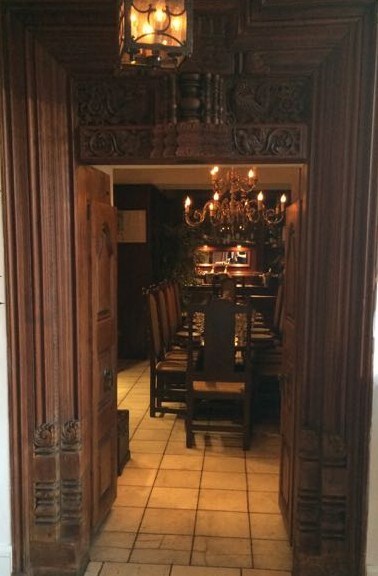 ), and that the dark wooden panelling and intricate carvings of the private dining “Tiffin” room feels both intimate and impressive. We were served a set menu designed to showcase the cooking skills and ingredients used by the enthusiastic team. Before dinner we had canapés: the Paapri Chaat was light and crisp with a truly mouth-watering topping, and the Amritsari Cod was served with a batter so light and well cooked it was hard to tell if it was batter or crisp cod skin we were crunching. On to starters we tried a spicy chilli paneer, and a fusion salmon and goats cheese samosa. We also had a Koyla Murgh – that’s tandoori chicken which is served as complete chicken joints hanging on skewers, apparently this is the traditional serving suggestion rather than having it chopped and plated with lettuce. For mains we had dishes including Kahari Paneer, Makahani Murgh, and lamb chop masala. 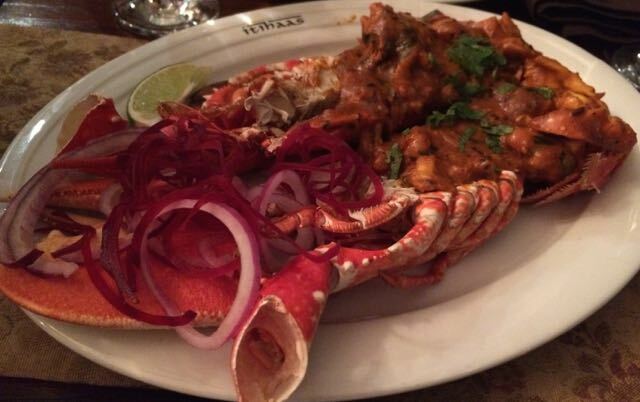 We also had an impressive dish of Lobster Panchphoran – a whole lobster cooked in coconut curry – not a traditionally Indian dish, but nonetheless it was a showstopper. I’m not a fan of Indian desserts, and I’m afraid they weren’t able to win me around. We tried a chocolate samosa with apple and ginger, and halwa pastry filled with chocolate and apple which was served with kulfi. There was nothing wrong with them per se but Indian desserts just don’t seem to blow my skirt up. They were served on slate. Ugh. The scourge of many an OCD diner who doesn’t want ice cream running off on to the table. The verdict – the food was excellent, seriously tasty stuff. The Tiffin room is a gorgeous space for a special occasion, and the rest of the restaurant is also attractive. It is around £40 a head for a la carte dining excluding drinks, which does put it at the top end of the Indian restaurants in my previously defined “tier 1”. We’d go back for a special occasion, but for me at least, Lasan has pipped it to the post for Brum’s top Indian restaurant. 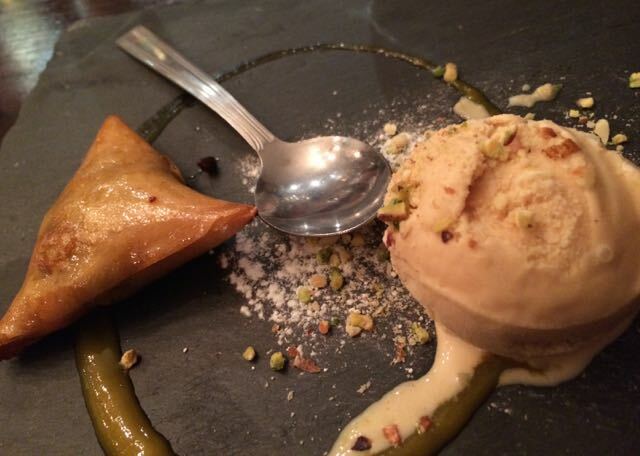 This entry was posted in Area: Colmore Business District, Area: Jewellery Quarter, Cuisine: Indian, Price: Get your dad to pay - above average, Venue type: Restaurant and tagged Birmingham Indian, Birmingham Restaurant, birmingham restaurant review, birmingham review, eating out in birmingham, Out In Birmingham, out in brum, OutInBrum, restaurant review, where to eat in birmingham, Where To Go In Birmingham, where to go out in birmingham. Bookmark the permalink. Another good review Chaps. I’ve not tried it, but I do like Lasan – and at similar prices, I’d stick with what I know.